Last revised 21 April 2012. Animation made from seven LROC images of the Apollo 17 landing site, ordered from sunrise to sunset, and showing the changing length and location of the shadow cast by the U.S. flag erected by the crew. The frames are: (1) M116113215RC, Sun 8 degrees above the eastern horizon; (2) M131447374LC , 11 deg. east; (3) M129086118LC , 35 deg. east; (4) M109032389LC , 68 deg. east; (5) M134985003RC , 26 deg. west; and (6) M117291316LC , 5 deg. west. 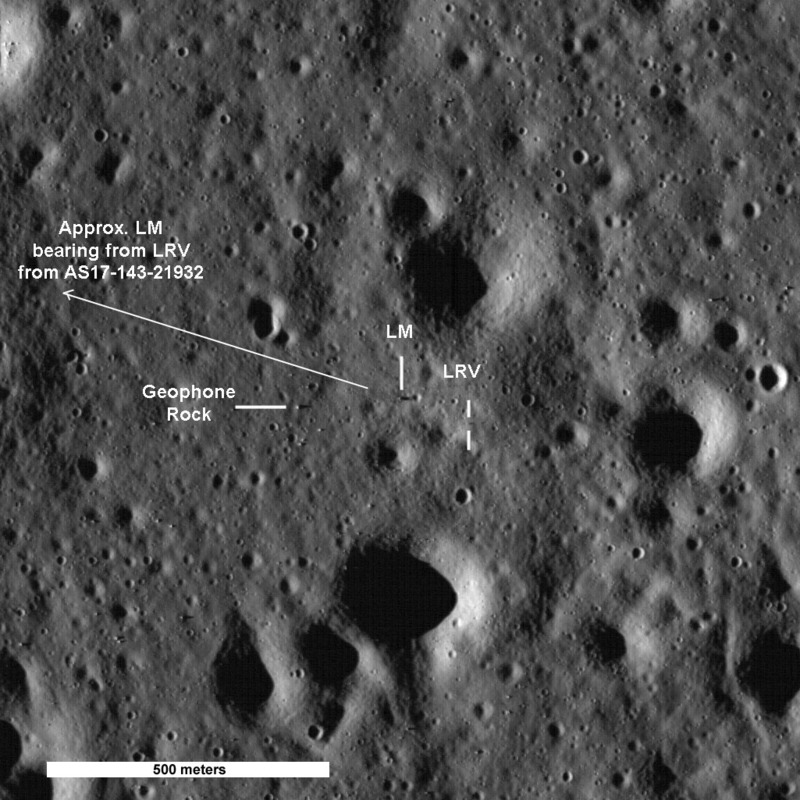 LROC images courtesy NASA/GSFC/Arizona State University. The Apollo 17 moon landing occurred on December 11, 1972. 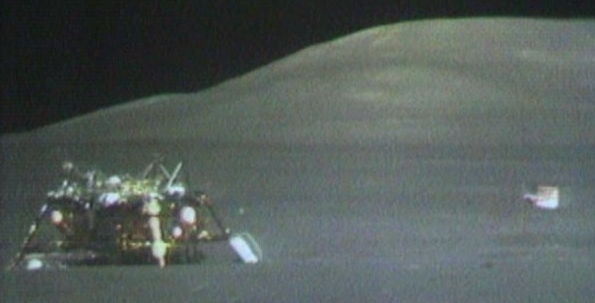 The LM crew spent 75 hours on the lunar surface, deploying a US flag early in EVA-1. This particular flag had flown in the Mission Operations Control Room (MOCR) in Houston during Apollo and was noticeably larger than the flags deployed on the previous missions. 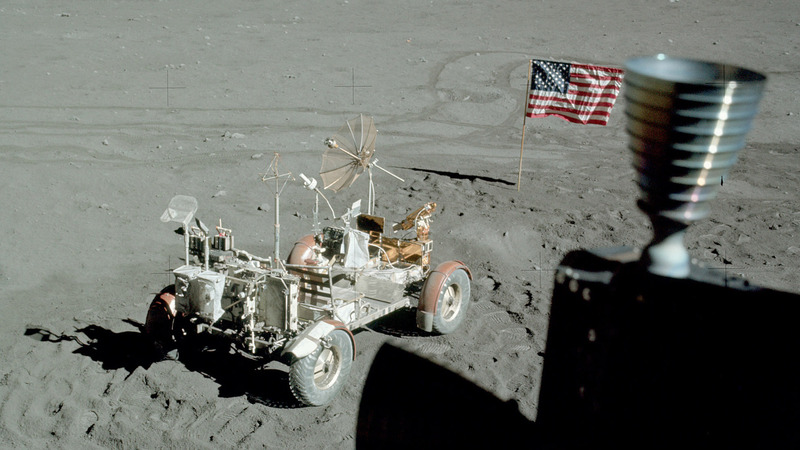 A comparison between the Apollo 16 and 17 flags, as deployed, indicates that in width and height, the Apollo 17 flag was about 20 percent larger than the Apollo 16 flag. Also, the lower section of the Apollo 17 flagstaff (below the gray joint section) is about 10-20 cm farther in the ground than the Apollo 16 flagstaff. After seeing the obvious tilt of the Apollo 16 flagstaff in the post-liftoff TV may have convinced the Apollo 17 crew that they should hammer in the lower section of theirs. As indicated in an overall discussion of the six flags left on the lunar surface, there are questions as to whether the flag material disintegrated over time or whether any of the flag poles had fallen, either during the Lunar Module liftoff or anytime afterward. This article resolves this issue for Apollo 17. Image taken by the Rover-mounted TV before Ascent Stage liftoff. The camera was operated remotely from Houston. The flag is still pointing in an easterly direction. 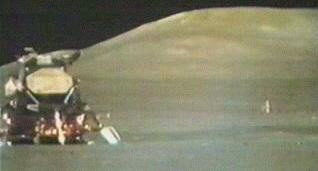 TV image taken after Ascent Stage liftoff. The flag swung around to a northerly direction because of engine exhaust. Note that the fabric loop holding the bottom left corner of the flag to the pole seems to have slipped upward, raising that corner of the flag, at least temporarily. Because the flag is outstretched horizontally, parallel to the ground, perpendicular to the Sun’s rays at dusk and dawn and not drooped or tilted, it will cast the best possible shadows for imaging by the LROC. This stack displays the six LROC images details used to make the animation at the top of the page. The vertical yellow lines approximate the east-west location of the flagpole. In the early morning images at the top of the stack, the flag shadows start from points west of the flagpole and end farther west. The situation is reversed for the late afternoon images at the bottom of the stack. Preflight image of an Apollo flag assembly, possibly Apollo 11. The upper part of the flagpole is at the top, with the support rod for the top of the flag attached by a latching hinge at the right. The bottom section of the pole is below those two items. The portion of the bottom section that is pushed or hammered into the surface on on the right, with two short knurled sections indicating how far the pole should be pushed in for adequate stability.